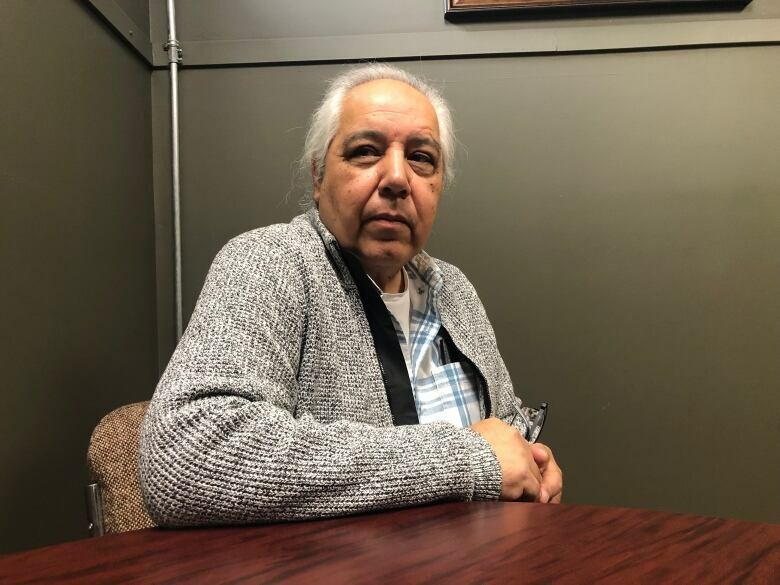 The name of the Osha condo project was chosen to represent the neighbourhood's origins, but Mohawks in Kahnawake say they were not consulted. A real estate project in a Montreal neighbourhood has raised eyebrows over the use of first contact imagery of First Nations in its advertising campaign. Ioana Comat, a Hochelaga-Maisonneuve resident, saw the billboard for Osha Condos on her way home from work. 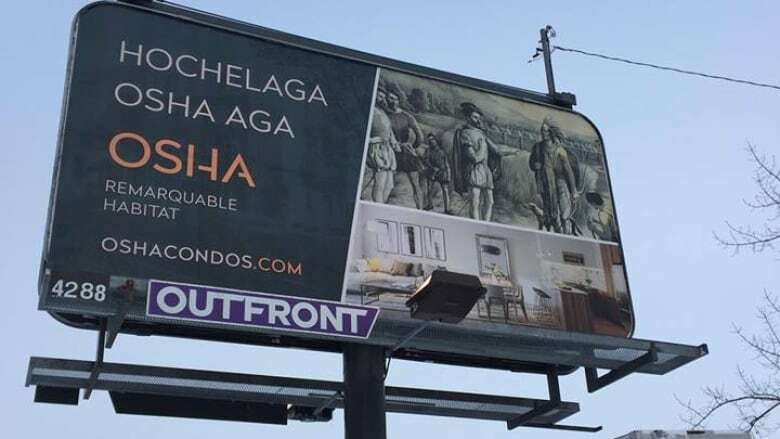 The advertisement, which is located on Ontario Street between Montgomery and Hogan Streets, has the words "Hochelaga," "Osha Aga," "Osha" and the slogan "Habitat remarquable" with a historical illustration depicting Jacques Cartier and First Nations above the interior of a condo. Comat called it a case of cultural usurpation and posted a photo on Facebook to draw attention to it. 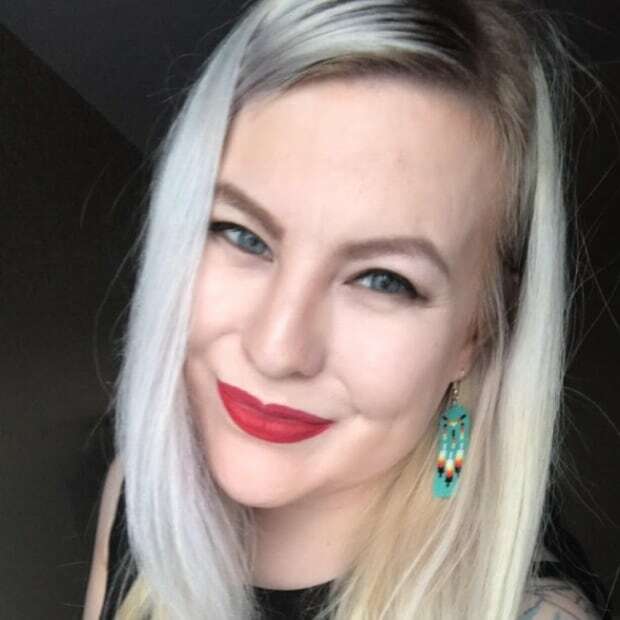 "I think this is my responsibility as a guest on Mohawk territory to use my white privilege to call out such a lack of respect," she said. She said it's an issue because "a dominant group takes advantage of its influence and its financial means to tell the story of people that theirs has colonized, oppressed for centuries, without the involvement, even the consultation in this project, of the members of any First Nation." The developer Groupe Altius is behind the Osha Condos project, a plan to build 200 housing units at the intersection of Sainte-Catherine Est and Nicolet streets. Hugo Deschênes, the project's marketing manager, told Radio-Canada that he was surprised by the criticism and that the name was chosen to represent the neighbourhood's origins. 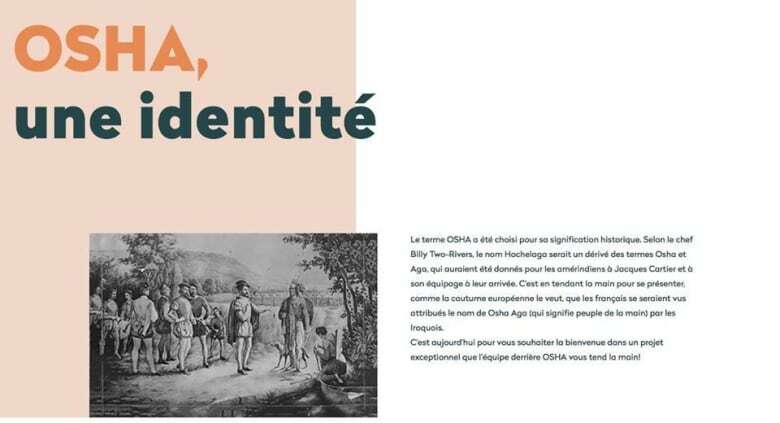 He said that after doing some research, he found that the name Hochelaga could come from the words "osha aga," which means "people of the hand" in Kanien'kéha. It's said the name may have been given to Jacques Cartier and his party because of their custom of extending their hands in greeting. The real estate project had this explanation on their website on how they chose 'Osha' for the name. They credit Billy Two Rivers. It's the story that Billy Two Rivers, a former council chief and pro wrestler, tells in Kahnawake. His name appeared on one of the advertisements for the condo project explaining the origin of the name. Two Rivers, who is currently hospitalized, said he was never consulted and is now considering his legal options. "They shouldn't be doing that," he said. "They're just like Van Morrison." In 2017, Two Rivers settled a lawsuit against Van Morrison about a photo of Two Rivers used on an album cover without his consent. Two Rivers isn't the only one concerned. Ross Montour, a council chief at the Mohawk Council of Kahnawake, called the marketing an issue of appropriation. "They're not honouring anybody," said Montour. "They're using somebody's name and a story that they feel is related to them, that related to history as a selling point. That's not an honouring, that's a commercial use of somebody's name, somebody's history beyond Billy Two Rivers, for commercial gain. How do you justify that? You can't." Deschênes declined an interview with CBC, but said in a statement the project will remove certain historical references in light of the criticisms. "We are sensitive to the questions raised by some people regarding our recent advertising campaign. The purpose of the latter is not to offend anyone." The same statement also now appears on the project's website.